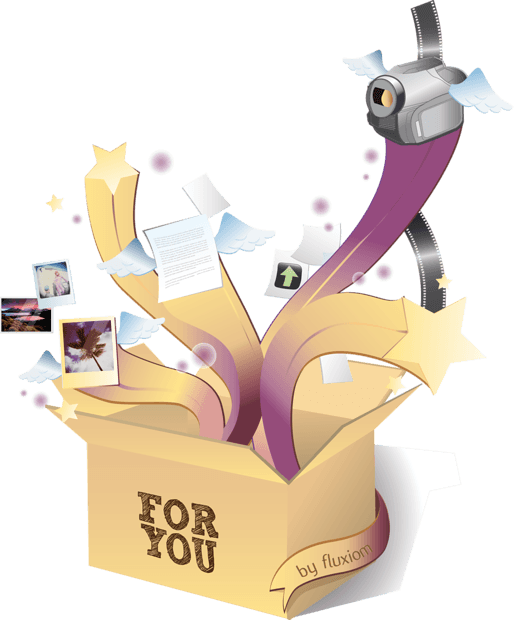 One of the best things about fluxiom is that it completely replaces FTP servers for deliveries: upload, share, done. If your job also requires you to accept files, however, chances are you still operate an anonymous FTP server, rely on your iDisk or simply wrestle with email attachments and their rheumatic-snail speed. Thanks to fluxiom’s new Inbox feature, this too is now a pain of the past. The Fluxiom Inbox allows you to activate and customize a convenient, upload-only page through which people can send you files and documents directly to your fluxiom account, ready for you and your team to work on. The Inbox requires no configuration on the public side, and is compatible with all modern browsers. It’s also secure because it gives no access to your data: only uploads are allowed. What’s more, you can embed your fluxiom drobox on your blog or web site for faster access. Use your Fluxiom Inbox to receive photos to process, resumes from applicants, term papers from students, mock-ups from marketing, whatever makes your business tick. As always, fluxiom will immediately process the information you receive and make it searchable in a matter of seconds. Activate your Fluxiom Inbox today, and say good-bye to FTP for good: simply log in to your account, click on the “Account” tab and click on “Inbox”. From there, you can activate your Inbox, fine-tune its behavior and download buttons to promote it. Finally, we would like to grasp this occasion to thank our dedicated users for their continued support. The Fluxiom Inbox was inspired by your feedback: as always, we hope you like it and will welcome any comments or thoughts you may have, on this or any other fluxiom feature.